« Which Nation Has the Worst Dependency Ratio? 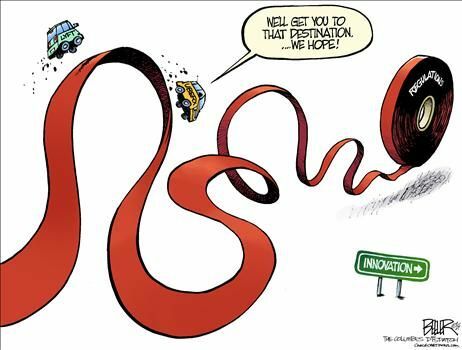 What’s the best way to understand the burden of government regulation and red tape? Is it better to focus on the overall burden by sharing data about aggregate cost, job losses, time wasted, and foregone growth? Or is it better to look at specific examples of regulatory foolishness, such as silly rules that force consumers to use crummy dishwashers, inferior light bulbs, substandard toilets, and inadequate washing machines? If the latter approach is best, we have a great (in a bad sense) new example. Nicole Carroll of CrossFit has a column in the Washington Post that dissects a disturbing new regulatory scheme from the busy-body local government. D.C….government is developing misguided regulations that would add burdensome red tape to the most innovative fitness programs. Specifically, the D.C. Council has enacted a law — the first in the nation — that would define what personal fitness trainers can and cannot do, require them to register. Just in case you think this sounds reasonable in theory (and you shouldn’t), take a look at what it means in practice. If early drafts of the regulations are advanced, D.C. fitness trainers will have to divert their attention from improving lives to bureaucratic burdens: taking courses they don’t need, adhering to methods they don’t believe in, paying fees that will be passed on to their clients and looking over their shoulders at ever-present regulators. The draft regulations even call for a four-year college degree. Huh?!? Why would a personal trainer need a college degree? And why should trainers be forced to take courses or follow one-size-fits-all methodologies? Sounds like a bunch of red tape that will make it hard for low-income people to become trainers. And what will this mean for consumers? Well, higher costs at the very least. The immediate impact would be to make fitness programs less accessible, more expensive and more elitist. Thousands of residents would lose the opportunity to follow programs that will help them get stronger, lose weight and enjoy a better quality of life. Sound like a lose-lose proposition, right? Who could be for such a bad idea? Why are D.C. politicians pushing such a foolish plan? The answer is special-interest corruption. …entrenched interests can drive up costs and close markets for competitors, preventing new products and services from improving the status quo. The groups pushing hardest for licensure are entrenched institutions such as the American College of Sports Medicine, the National Strength and Conditioning Association and the Register of Exercise Professionals. …a not-so-credible agenda to defend their long-established but increasingly threatened business models and stifle successful competition. They want the licensing because they will profit from it. For those in the Exercise Industrial Complex, the fear of disruptive competition explains why they want to make the District the first jurisdiction in the nation to regulate fitness programs. Instead of raising standards, burdensome regulations would have the effect of driving newcomers out of the industry — and pricing many moderate-income people out of fitness programs. Licensing and regulation of personal trainers is just one example of a worrisome trend in governments across the country. This video from the Institute for Justice has disturbing details of how special interests conspire with politicians in various states to impose high burdens that make it hard for people to work. Isn’t this typical? Politicians always claim to be for the little guy, but licensing rules are all about erecting high barriers to protect entrenched incumbents from competition. 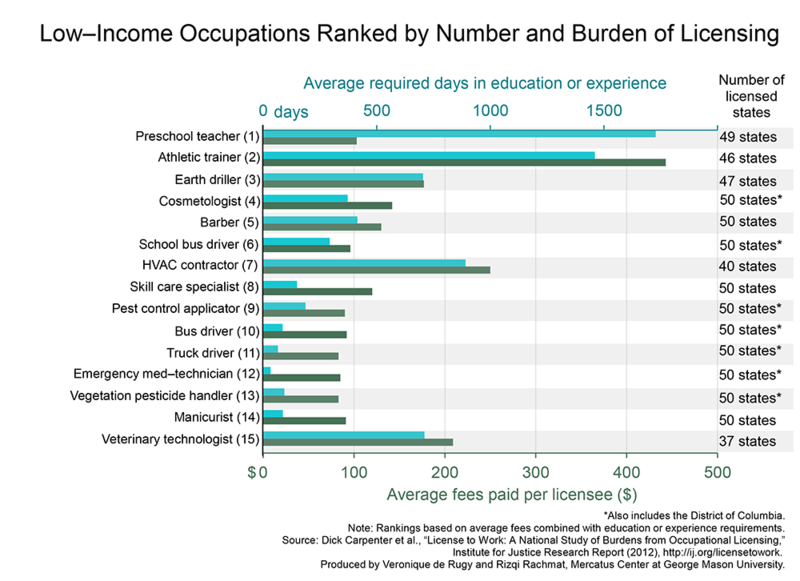 This chart shows how much time and money is needed to work in certain professions that generally use lower-income workers. By the way, the same principle applies to the tax system. The political elites often argue against a flat tax because it would be a boon to the rich. But it’s the powerful and well-connected that benefit from the Byzantine system of credits, exemptions, deductions, exclusions, preferences, and other loopholes in the tax code. Rest assured that poor people aren’t hiring all the high-paid lobbyists that specialize in manipulating the tax code in Washington. Which is why honest and well-intentioned leftists should support real tax reform. Just like they should support sweeping deregulation. Well, I assume the primary beneficiaries would be the bureaucrats who get jobs monitoring compliance with all the regulations and handing out the licenses. Not mentioned in the article is the consequence of what I once saw labeled as ‘Gold’s Hypothesis’, that in laws meant to benefit someone, about 90% of the benefit flows to someone else. In this article the benefits would mostly flow to the extra-education providers, the gatekeepers of licensing, rather than to the people working in the occupation. Back in the mid-1990s I attended by invitation a conference in NYC of our accounting firm (then one of the top 4 international accounting firms). At the time there was much talk about implementing a flat tax in the USA. Needless to say a good deal of the conference was taken up discussing the flat tax and reassuring the 1000+ attendees that the firm would lobby hard against any such flat tax. Clearly the firm was threatened by the prospect of a tax code that was easy to understand by their clients. Regulations are more often put in place by businesses lobbying for protection from competition than from well meaning but clueless governments. It’s a deliberate strategy to cut others out of opportunity.